Have you heard a version of the phrase “No man ever steps in the same river twice, for it's not the same river and he's not the same man” by Heraclitus? Events are like the river in that you cannot have the exact same event happen again. For this reason, a photographer is a important part of your team to help preserve the beautiful moments that will happen at your upcoming event or wedding. Since you are likely spending a fair amount of money on your event, let’s discuss how to hire and communicate with a photographer to get the most, BEST photos of your event. Where to find and hire a photographer that matches your style and has the appropriate package for your event or wedding. Then we will dive into all the communications that should happen before, during, and after your event, so you can trust your photographer to be at the right spot when something incredible happens. 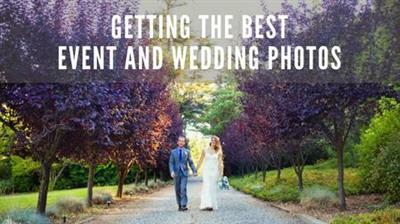 To wrap up this course, Natalie will share some words of wisdom and tips for couples to pose for their wedding and engagement photos. By the end of this course, we hope you will feel confident in booking a photographer that is right for your event or wedding. We also encourage you to over-communicate with your photographer, while listening to their advice, so you both know what to expect to happen at the event.